Qualifying practice shall be of 1 session of maximum 45-minute duration on Friday, June 28. The race shall be of maximum 180-minute duration, at night fall, on Saturday June 29. Cars must be presented in an appearance that reflects the period in which they raced and must conform to 2019 appendix K of the FIA International Sporting Code. Ideally, cars should be in possession of a valid Technical Passport (national or FIA). An entrant without Technical Passport for his car, is advised to contact his promoter. Cars with HTP take precedence over cars without HTP. Optional 2 or 3 drivers. The maximum duration of uninterrupted driving of a driver can not exceed 70 minutes. (With 15 minutes break before driving again). National A licence or above. Cars must comply with RACB mandatory safety rules. 107dB on the track, measured at 15m from the centreline of the track. The refuelling during the race will only take place at the Total petrol station located inside the paddocks down to the Eau Rouge. The driver must get out of his car and do the refuelling himself. The mechanics are not allowed in the refuelling area. Maximum quantity of fuel for each refuelling : 100 liters. 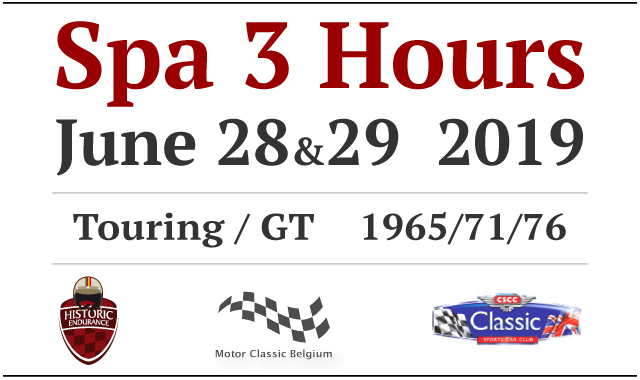 The entry fee is 1950 Euros per car. The fuel is neither included for the practice nor during the race.